LEARN FROM THE WORLDS BEST!!! DOWNLOAD THE 2019 REGISTRATION PACK HERE!!! Ready to take coaching to the next level? 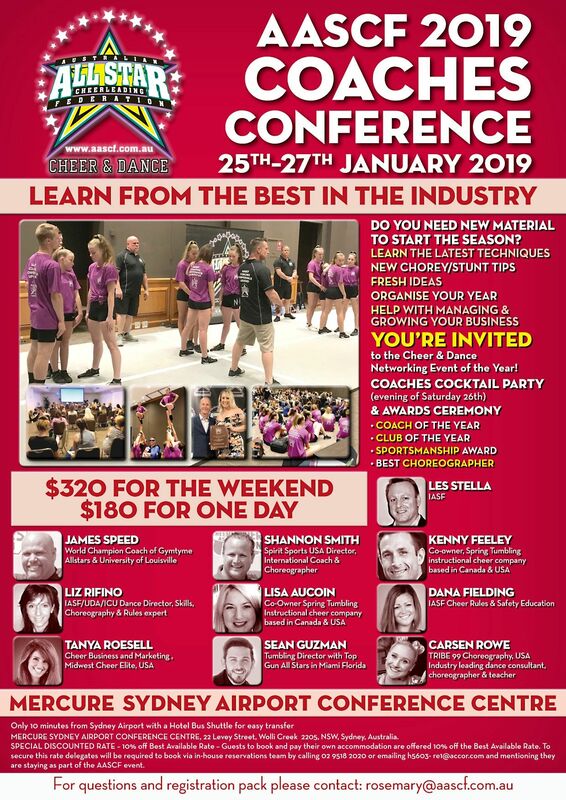 Join us in SYDNEY to learn from experts and meet other coaches from across the country at the largest and most conclusive Coaches Conference ever held in Australia!! You’ll walk away with the most innovative and current techniques to pass along to your team along with insider tips, advice and feedback from industry-leading professionals direct from the USA & Australia. All of the members of your program deserve to experience this day so they can be a part of the leading change in your gym and in the cheerleading industry as a whole. Split your team up and send a group of people to each class to make sure your program absorbs all of the info offered. Our sport is growing rapidly and you need to ensure you invest in your professional development and keep up to date and set your program up with the LATEST in tips for coaching, choreography, running of your program and credentialing. Guests to book and pay their own accommodation are offered 10% off the Best Available Rate. To secure this rate delegates will be required to book via in-house reservations team by calling 02 9518 2020 or emailing h5603- re1@accor.com and mentioning they are staying as part of the AASCF event. We are thrilled that due to the high calibre presenters we have been able to secure that we will be offering 50 separate conference sessions you can attend over the 3 days. The conference will be a combination of classroom style lectures as well as hands on / how to demonstrations on the show courts. NOTE **** We are offering a 10% discount if your club brings 4 or more coaches - each coach will need to fill out the registration form separately, nevertheless please take 10% off the total payment. “We are sad to be heading back to Brisbane tomorrow morning after a great weekend with friends. We cannot thank AASCF & the fantastic conference legends for sharing their knowledge and creating such a great event to attend. Lots of new drills, skills and techniques learnt and ready to implement into our program. We are ready for classes tomorrow!! 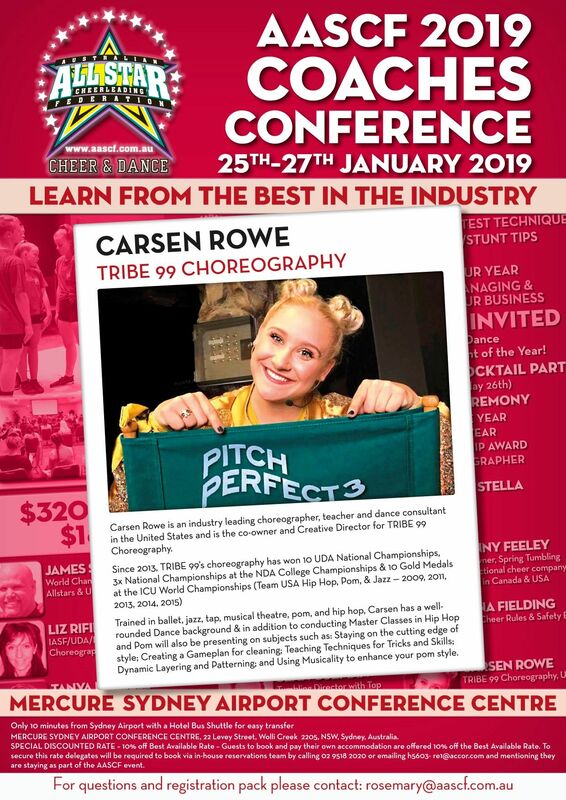 “So inspired after this year's coach's conference with the Australian All Star Cheerleading Federation (AASCF). 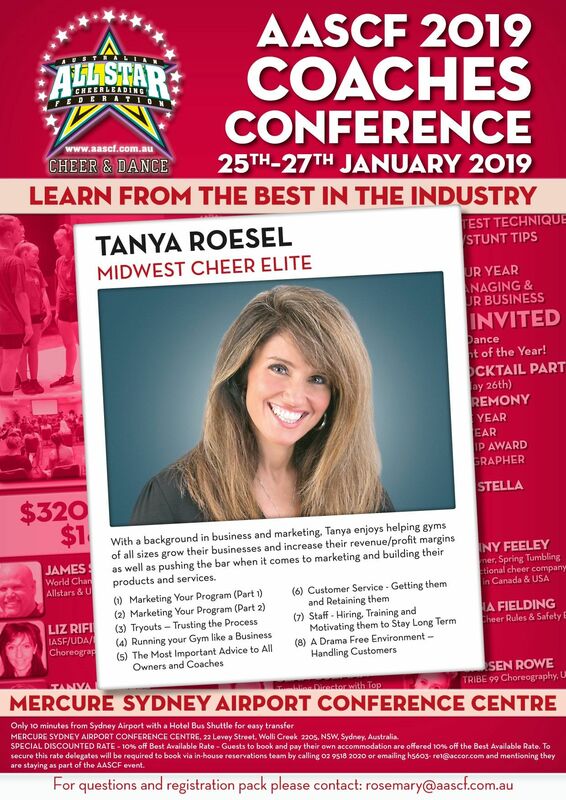 Feeling extremely grateful to learn from some of the most internationally influential people in the gymnastic, cheerleading and dance industry. NRG Studios Illawarra - Dance & Cheer is ready for a great year!